Will New FO3 esps need to be made for ttw 3.*? Also, could it be mentioned somwhere that we're not supposed to clean the FO3 esps before the conversion? Re: Will New FO3 esps need to be made for ttw 3.*? Yes. You need untouched vanilla installs of both games now. There will be a video on launch day from GamerPoets on how to install TTW. Firstly, I'm honoured by your reply... you're a bit famous you know. I ask because I just finished setting up a stable 2.9.4 version yesterday and ideally would just use the esps it made... not that important just curious. No, it won't use those, it's completely different now. 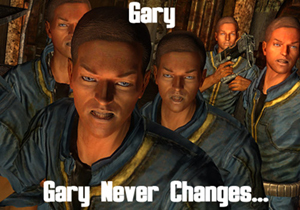 Am thinking of redoing my mod (Garbage Gurus- https://www.nexusmods.com/newvegas/mods/58996 ) to be set in the Capital Wasteland. Not so much a 'conversion' but more of a whole new mod... Aaanyhoo, as soon as the update is out I'll start looking into it.